Whole-hearted (covenanted) reformation is contrasted, throughout this sermon, with the half-hearted comfortable Christianity that has been common in most ages. Gillespie wields the sword of Scripture as few can in driving home a multitude of vitally important biblical points related to the individual, family, church and state. 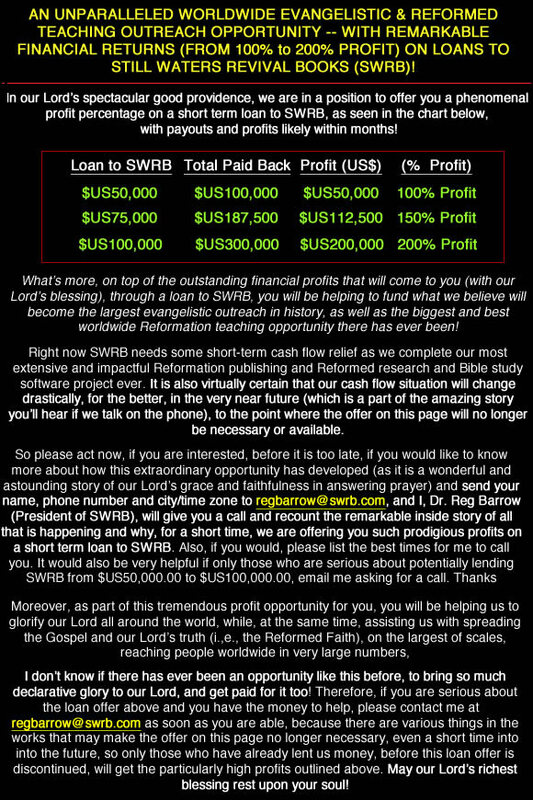 This sermon can be listened to over and over with increasing profit, as it contains a fullness which is almost impossible to absorb in just one sitting. Don't miss this one; it is a real gem - it may even be on the best sermons you will ever hear! This stellar sermon, read by elder Lyndon Dohms, was originally preached to the House of Lords in the abbey church at Westminster during the days of the Westminster Assembly (on August 27, 1645) - and is one of the sermons found in the 34 volume set of Puritan Fast Sermons published by Still Waters Revival Books. It deals with Malachi 3:2 and can also be found in volume one of Gillespie's two volume Works (also published by SWRB). 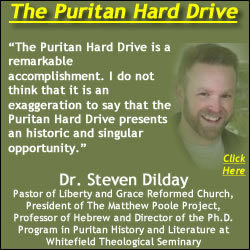 The 34 volume Puritan Fast Sermon set, and George Gillespie's two volume Works, are on the Puritan Hard Drive, along with over 12,500 additional Puritan and Reformed books, MP3s and videos. George Gillespie was one of the Scottish commissioners to the Westminster Assembly, the youngest member there, and undoubtedly one of the most influential. William Hetherington observes 'the effect produced by this singularly able work (A Dispute Against the English Popish Ceremonies Obtruded on the Church of Scotland - ed.) may be conjectured from the fact that within a few months of its publication, a proclamation was issued by the Privy Council, at the instigation of the Bishops, commanding that all copies of the book that could be found be called in and burned by the hangman. Such was the only answer that all the learned Scottish Prelates could give to a treatise written by a youth who was only in his twenty-fifth year when it appeared.'" - William Hetherington, "Memoir," from the Works of George Gillespie, p. xviii. "Noted for his erudition, keen mind, powerful debating skills and articulate speech and often called 'Great Mr.Gillespie' in his day, he has been referred to as the prince of Scottish theologians and the supreme defender of Presbyterian church government." - Dictionary of Scottish Church History and Theology, p. 359. "That is an excellent youth; my heart blesses God in his behalf. There is no man whose parts in a public dispute I do so admire. He has studied so accurately all the points that are yet to come to our (Westminster-ed.) Assembly; he has got so ready, so assured, so solid a way of public debating; that however there be in the Assembly divers very excellent men, yet, in my poor judgement, there is not one who speaks more rationally and to the point than that brave youth has done ever." Robert Baillie, Letters and Journals. "George Gillespie was one of the greatest theologians of all time - almost singlehandedly steering, by God's grace, the Westminster Assembly on a number of vital points." - Dr. Reg Barrow. "... in all those debates (in the Westminster Assembly-ed.) no person took a more active part, or gained more distinction than George Gillespie," though he was the youngest man there. Furthermore, Hetherington calls him a "genius of the highest order," and writes that his work "dazzled and astonished his countrymen." He "held an undisputed position among the foremost of the distinguished men by whose talents and energy the Church of Scotland was delivered from the prelatic despotism" of that day." - William Hetherington.